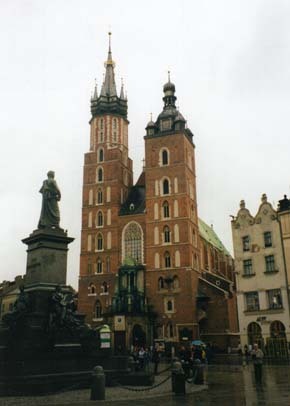 Please go to the Church of St. Mary (Mariacki) on the corner of the main Market Square - you really can't miss it. Listen to the bugle that announces the hour: its call, known for centuries as the Hejnal Mariacki, is curiously truncated. Many people in Cracow today will explain this as a tradition which dates back to 1241, when a bugler was allegedly killed by an arrow from Tatar invaders as he sounded his alarm. That is also what you will find in most of the tourist guides. It is through customs such as this that the past is alive in the present, even in a complex modern society such as ours. Indeed this bugle call was adopted in 1927 by national radio, and a live rendition (not a tape) is transmitted every day at midday. The replacement of a communist government by a democratic one has not affected this sort of cultural continuity. But the history of this custom is more complex than most citizens realise. In fact the use of a bugle call for timekeeping cannot be found in historical records until the end of the fourteenth century. The custom went into abeyance in the seventeenth century but was revived in 1810. However, the connection with the Tatar invasion of 1241 was not made until the inter-war years of the twentieth century. In 1928 an Irishman called J. P. Kelly published a children's book in the United States called 'The Trumpeter of Cracow', and it is this version which is now repeated in city guidebooks and engraved into the consciousness of residents. So, far from being evidence of the persistence of ancient custom, this is an apt illustration of globalisation and 'invented tradition'. But though there is probably no direct link between this bugle call and a historical event in 1241, this does not detract from its meaning for Polish people today. Please think of comparable examples of invented tradition from the histories of your own countries. What are the major landmarks in popular perceptions of past time? Can history and myth always be kept quite distinct? Ania and Tom followed their assignment and visited St. Mary's Church. There were too many tourists here. 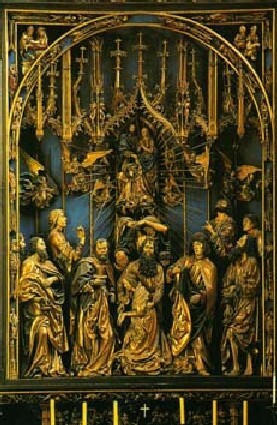 Ania paused for some minutes in front of the splendid carved altar. Her thoughts, however, were with the disturbing faces of the AIDS sufferers and other beggars who beseeched visitors at the church entrance. Tom told her that most were not Poles at all, but Gypsies from Romania. Leaving the crowded church, they crossed a smaller market and continued beyond the inner ring road into a quieter zone of buildings that had once been elegant but now seemed grey and delapidated. 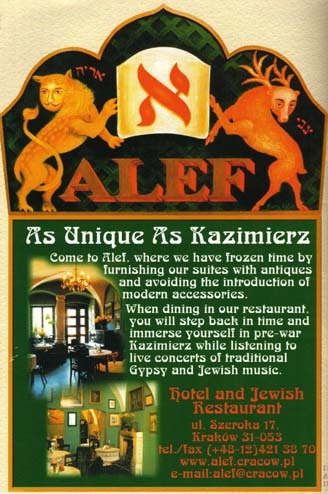 Figure 15: Authentic Jewish Restaurant?